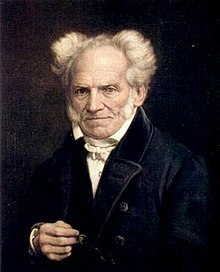 Arthur Schopenhauer (German: [ˈaʁtʊʁ ˈʃɔpənˌhaʊ̯ɐ]; 22 Februar 1788 – 21 September 1860) wis a German filosofer. ↑ "John Gray: Forget everything you know — Profiles, People". London: The Independent. 3 September 2002. Archived frae the oreeginal on 9 April 2010. Retrieved 12 March 2010. This page wis last eeditit on 26 Mairch 2018, at 21:24.